Some budget laptops are hefty and rather lumpen. Packard Bell’s Limited Edition Easy Note MB88 P-003, by comparison, looks dainty and, indeed, weighs a fairly modest 2.6kg. 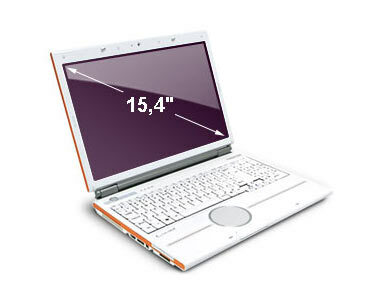 The Packard Bell EasyNote MB88 P-003 Limited Edition is the middle one of the three-strong Limited Edition range and has a ‘sunny’ orange accent running along the groove of the case exterior and on either side of the main unit. Another notable feature is the glowing white light strip halfway down the free area below the Packard Bell EasyNote MB88 P-003 Limited Edition’s good-sized, comfortable keyboard. We’re not sure what this contributes, save for a talking point, but it can be turned off should it prove too distracting. The light strip bisects the Packard Bell EasyNote MB88 P-003 Limited Edition’s generous circular touchpad, which Packard Bell has positioned off-centre. This arrangement works, however, as the main keyboard has a numeric companion pad to its right, meaning the touchpad and the long selector paddle below it are dead-centre of your qwerty setup. Packard Bell can afford for the Packard Bell EasyNote MB88 P-003 Limited Edition’s screen to be less of a lavish affair than some of the other notebooks we’ve tested recently as it’s put in the legwork making a distinctive-looking machine. Instead of the ultra-gloss favoured by other manufacturers you get a standard finish to the Packard Bell EasyNote MB88 P-003 Limited Edition’s 15.4in display. However, the inclusion of a high-definition multimedia input (HDMI) port is wasted given that the screen resolution is limited to 1,280×800 – not enough for 1080p true high-definition video playback.